Congratulations to the British Team behind the British Steam Car Challenge with their car ‘Inspiration’. Today they broke the record they set yesterday with a new land steam speed record of 148mph for the measured mile averaged across two runs in opposite directions. For more news see the UK Steam Car Club. UK steam car breaks oldest land speed record! They’ve done it! British Steam Car Challenge driven by Charles Burnett III has broken the land speed record for a steam car averaging 225.055kph (139.843mph) on two runs over a measured mile. The car weighs around three tonnes and measures 7.6 metres (25 feet). It is powered by a steam turbine driven from 12 boilers containing around 3.2km (2 miles) of tubing. The car runs on clean-burning propane producing superheated steam at 400C. The steam enters the turbine at more than twice the speed of sound. The aerodynamic body is made from carbon fibre composite and aluminium on a steel space-frame chassis. While this car won’t translate into the next green steam sports car, the innovation that has gone into the design will spin off into many areas, from autoclaves to pressure systems. That said, it is tempting to wonder how well just one of those boilers might be adapted to drive an updated Stanley or Doble to make a lively quick starting road car. The official record has stood since 1906, and while there have been individual runs, such as the 1985 ‘Steamin’ Demon’ the international measuring authority requires two runs in opposite directions within 60 minutes. Previous attempts have only managed one-way runs. Even so, the British team from Lymington achieved 150mph on one of the record-breaking runs. The team will try to better the record tomorrow. For more information, see the UK Steam Car Club. Once the record attempts are over the car will be placed on permanent display at the UK National Motor Museum at Beaulieu. 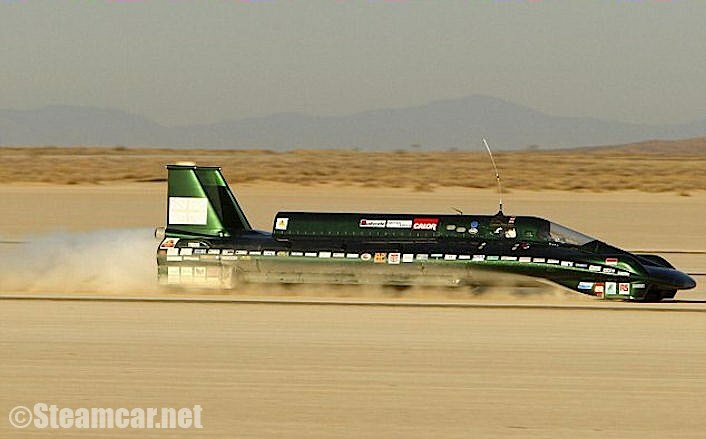 With the timing equipment being set up on the 7mile lake bed at Edwards Air Force Base and battling extreme daytime temperatures well over the old century, the British Steam Car Challenge is showing every sign of being capable of breaking the official land speed record for a steam powered car. The record, set in 1906 at 127.69 mph has already been passed in tests with the car reaching 148mph yesterday and averaging 131mph for the two way run within 60 minutes as required by the international timing federation (FIA). The team recognises that the fastest steam car to date – and the one to beat – is the ‘Steamin’ Demon’ of the “Barber-Nichols Team”. On 18th August 1985 The Barber-Nichols Team carried out three successful passes and achieved an American National Record at 145.607mph. But at that stage there was no attempt to establish an FIA record. That car used a conventional piston engine powered by a boiler designed by a student of Abner Doble for use in a steam powered bus. When the us trials fell through, the Barber-Nichols team acquired the power plant and installed it in a car. With the formal record attempts to commence at 2.00pm GMT, 53 year old principal driver Charles Burnett III is no stranger to world speed records – mostly on water. He holds world records using catamarans and monohulls powered by diesel, petrol and LPG. He was included in the Guinness Book of World Records in 1999 for an offshore water speed record of 137mph. 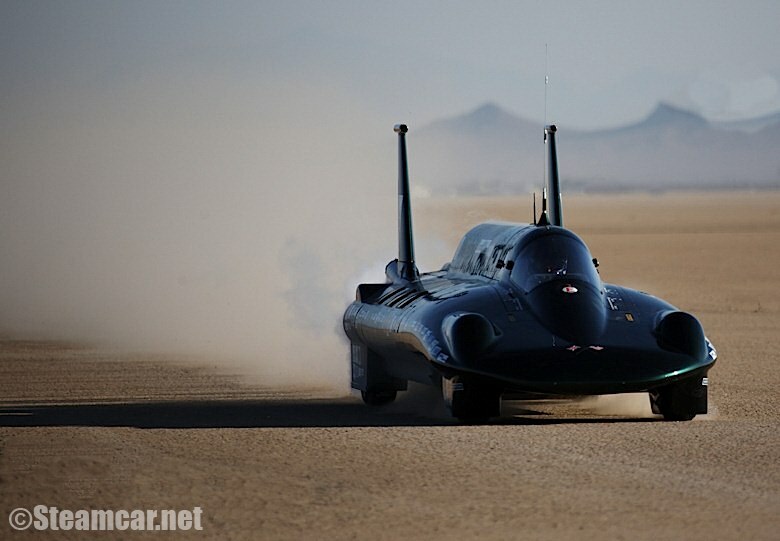 The British attempt on the world steam speed record has been unofficially broken by the team on Edwards Air Force Base in the USA. After several setbacks, the test driver Don Wales has reported that the car is now running well and the team is preparing for an official record attempt on 17 Aug when the FIA official timers will be in place. The car – dubbed the world’s fastest kettle – is capable of boiling water at the rate of 23 cups of tea per second – the steam drives a turbine which is geared to dirctly drive the rear wheels. The latest run of 131 mph is the fastest so far, and is faster than the current official record which stands at 127.69 mph. As one of the individual sponsors of this car I wish the team well!